The last few years and even decade the tarot has left the traditional places where he was to be found and entered a more mainstream phase of its existence, one of these are the Jungian (based) therapies. 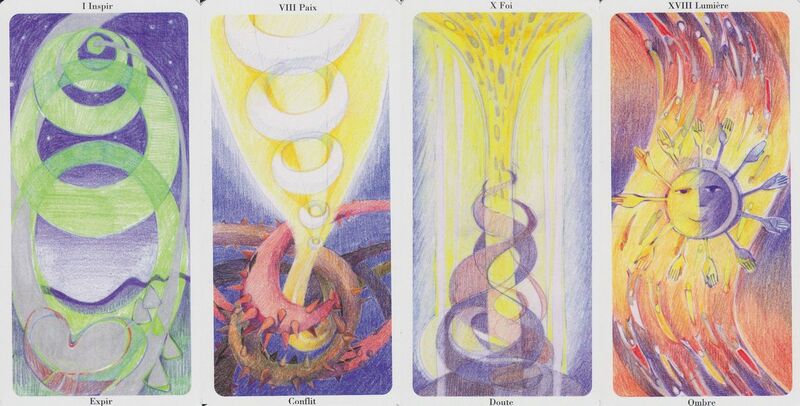 The creator of this deck who approaches the person as a whole taking into account the psyche and body but also the social dimension of the person has created this deck as a way to help us identify problems and linked to them strengths and so proposing a solution to mend those. All 22 cards in this colourful and semi (or in some cards almost entirely abstract) deck have been renamed and received 2 'titles', representing polarised archetypal dynamics, 22 human resources linked to 22 problems, called archetypes. These 22 archetypes correspond relatively well to the classic tarot archetypes or some of their aspects.